The San Francisco Contemporary Music Players are beating all other local concert presenters to the punch, in a big, big way: their upcoming Sweet Thunder Festival, scheduled for April 24-27 at Fort Mason, will include first Bay Area appearances (I believe) of the JACK Quartet and International Contemporary Ensemble, aka ICE. Also appearing: red fish blue fish, Morton Subotnik, SFCMP itself, and others. Tickets to the whole festival are $150 general / $60 student (with ID), $30/$12 per concert. UPDATED: Because I forgot to link to Anne Midgette's article. Would love to see a graphic showing the opposite of Andy's. Will Robin writes a blog posting for The New Yorker, and Andy Doe, who already cracked the whip on Vanhoenacker, provides a stupendously great and very funny graphic. Make sure to look at the URL for the blog posting! As usual, Jon Silpayamanant has wise words. 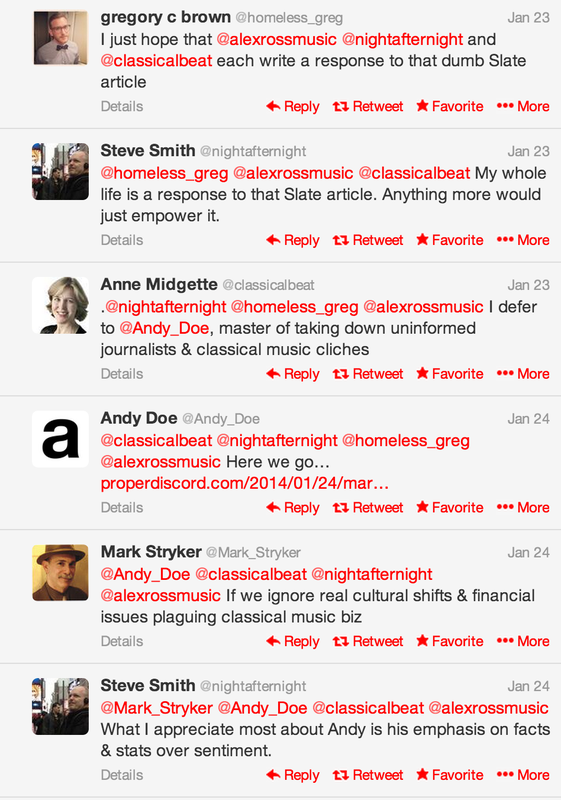 Anne Midgette takes issue with almost everybody. Perhaps a few people will take issue with her. Here's a fine article by David Stabler that looks at the specifics of some organizations without sensationalizing anything. After missing Il Prigioniero at NYPO last year, I'm especially glad to catch it in London. H/T Sarah Noble for pointing me to it; I had taken a glance at the Southbank Centre's godawful web site and managed to overlook it. 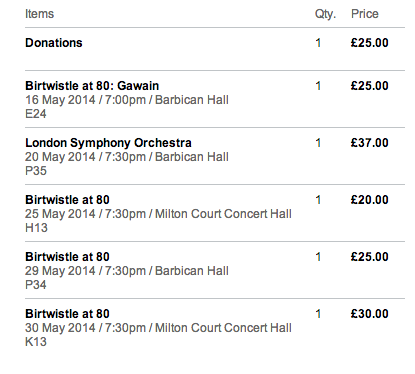 Also, color me puzzled why the Barbican was able to print and mail the Birtwistle tickets to me but the Southbank Centre's ticketing system told me they couldn't send a ticket to my address in that obscure location, California, United States of America. The postage to mail a one-ounce item from London, UK to CA, US cannot be that ruinous. The annual San Francisco Symphony Winter Sale ends Friday; get your tickets to lots of hot events (Carey Bell plays the Nielsen clarinet concerto; Peter Grimes; the Serenade for Tenor, Horn, and Strings; Mahler's 3rd, with Sasha Cooke; Ton Koopman's Bach Family programs; Christian Tetzlaff in the Bartok 2nd violin concerto, etc, etc.) before it's too late....Switchboard Music Festival will be on Saturday, April 12, from 2 p.m. to 10 p.m. at the Brava Theater, 2718 24th in SF; their programming includes appearances by the Kronos Quartet, Mobius Trio, Grex, Gamelan X, Odessa Chen, Matthew Welch, Jordan Glenn and Michael Coleman, Splinter Reeds, The Operators, Dublin, Makeunder, and music by Anna Clyne, Julia Wolfe, Ryan Brown, and Deerhoof’s Greg Saunier. Tickets are a GREAT BARGAIN: $15 advance at switchboardmusic.com; $20 students/$25 general at the door....I'm mentioned in one of Steve Smith's contributions to the NY Times (classical) Playlist feature this week. Perhaps this will inspire me to finish a long-neglected posting about performances of Otello, live, on record, and on DVD, and why Martinelli is the only Moor for me....Stanford Live will host a live broadcast of Dallas Opera's production of Death and the Powers, an opera by Tod Machover, on Sunday, February 16 at 12:00p.m. The press releases notes that "Admission is free to the video simulcast but the public is encouraged to register in advance on the Stanford Live website at live.stanford.edu." Death and the Powers is conducted by Nicole Paiement, a great conductor and well known to opera audiences in the Bay Area; the cast includes Robert Orth and Joelle Harvey....Speaking of Paiement, Opera Parallele will present a tasty double bill on April 26, 27, and 28 at the Yerba Buena Center for the Arts: Poulenc's Les Mamelles de Tiresias and Weill's Mahogany Singspiel....Die Fledermaus is the current Lamplighters' production at YBCA, with a new English libretto by David Scott Marley. You Can Still Get Tickets to See This Program. Zachary Woolfe reviews the NYC performance of the program Marc-Andre Hamelin is playing in SF at Nourse Auditorium on Friday. Get your tickets here. Everything you send should include the day of the week, date, and time of that event you're touting. He said them very well, in this Chron article and in a subsequent blog posting. Ignore the article headline; the contract for Vanska's upcoming conducting stint at SFS was certainly signed long before the MOA lockout of the musicians. And Joshua didn't write it, so don't blame him. Wow. Here we've got a Times reader who thinks that abortion in the US started in 1973 with Roe v. Wade. I suppose it's possible that he or the Times omitted the word "legal,' but there's been abortion in the US for as long as there have been women. You can see plenty of evidence of abortion in 19th c. newspaper advertisements. You can see evidence of abortion in the five thousand women who died annually from illegal abortions before Roe legalized the procedure - which now has an extremely low complication and death rate. Making abortion legal and keeping it legal and readily available saves the lives of women, who will go to great lengths to end unwanted pregnancies. I received one of your cards in the mail today. I was wondering whether anyone noticed that the design is nearly unreadable. On the side with the addresses, there's a block of print in white 6 pt type on a red background. On the side with concert information, the background is a photo of your beautiful, colorful concert hall....with white type that might be 8 pt. I have very bad eyes and I can't be the only potential concertgoer who does. The difficulty of reading the postcard reduces my interest in attending (or publicizing) your concerts. 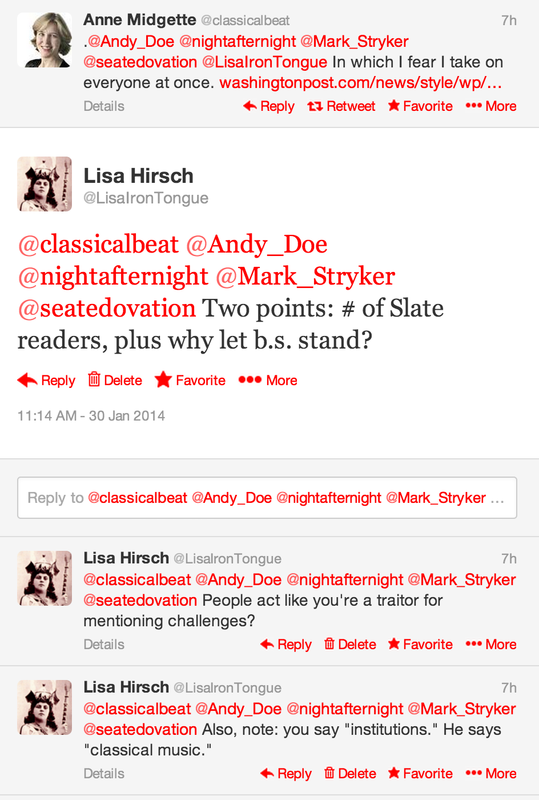 A writer named Mark Vanhoenacker wrote some really stupid things in Slate. What's so dumb? Well, asserting that classical music is dead, relying on selective quotations, failing to do his own research (or thinking), and an overreliance on unsupported assertions from Greg Sandow. Andy Doe had a few things to say to him in response (boy, howdy!). So does Adam Sliwinski, percussionist of the not-dead-any-time-soon So Percussion. Read and enjoy! How Does a Musician Know It's Time to Quit? That's a serious question. We've all heard singers who were still on stage years after their voices had become threadbare; we also all know of singers who retired, tantalizingly, when they were in prime form, apparently with years of good work ahead of them. I'm raising this question because of a concert I attended by a veteran ensemble where it quickly became evident that one member of this ensemble was having serious, and all-too-obvious, technical problems. The player couldn't play in tune in high and medium-high positions, which ruined one movement of one piece the group played. The player had bow-arm problems as well; there were all sorts of extraneous sounds and problems with articulating the music as written. The bow was not under good control at all. This player is a member of an ensemble; the other members must have noticed these issues, and after a look around, reviewers are noticing exactly the problems I heard. (The reviews I looked at noticed problems with a different member of the ensemble as well.) So....how does one go about conveying to a player that it's time? that the technical issues are dragging down the entire ensemble? What do you do when it's more than one member of the group? Who raises the issues? Other players in the group? The group's manager? Do the ensemble's written agreements include a process for dealing with this kind of problem? In a perfect world, the contracts would cover these potential issues when an ensemble is new and everybody is in top form. If reviewers are noticing the problems and nothing is happening, it's a problem for the whole group. Rejoice: Minnesota Orchestra Lockout Ends! A letter to our friends and community:The Musicians and the Minnesota Orchestra Board of Directors have ratified a new collective bargaining agreement, effective February 1, that brings the lockout of the Musicians to a conclusion. The Orchestra’s first concert performances back on stage at Orchestra Hall are anticipated in early February and will be announced shortly.“The Musicians are pleased that we have come to a solution with our board, and we are ready to begin the hard work that lies ahead together. We are eager to perform for our community at home in Orchestra Hall once again. We have seen firsthand the deep love for this orchestra, and we are confident that this community will, in fact, continue to support a world-class symphony orchestra,” said Tim Zavadil, clarinetist and negotiator.Keeping salaries in the top ten was a critical issue as it allows the orchestra to attract and retain the finest musicians in the country, building on the tradition of excellence that has been cultivated by the community over many generations. The agreement achieves this priority. With this agreement in place, we look forward to working with new board leadership to rebuild our relationship and the trust within the organization. We take heart that our treasured relationship with our audience will continue at Orchestra Hall.The Musicians thank each and every individual and organization that has supported maintaining a great orchestra for Minnesota over the past 16 months. We have been strong because of you and we will need your continuing strength and passionate voices as we move forward together.We are excited to work with you, our engaged community partners, as we re-vitalize the Minnesota Orchestra. Reuniting all who love great music and this orchestra, we can fulfill our mission of preserving this 110-year old institution and taking it to new heights.We will keep you informed of details as they become available in the coming days. Now comes some hard work: rebuilding an orchestra that has lost around 25 members and a great conductor; rebuilding trust; rebuilding. Full details at the URL above; commentary from me another time. There are three must-sees for me; the double bill, Florencia, and Ghosts. SFO Audience Incapable of Comprehending Other Languages? Un ballo in maschera, La Cenerentola, Les Troyens, and Le Nozze di Figaro are hard! I cut the company slack on La Ciociara because so many Americans can't remember what to do with the pesky letter c in Italian. I guess there is no way around Partenope, which many undoubtedly pronounce Party-nope instead of Par-te-no-pee. Cinderella is just plain confusing, bringing up visions of Disney in my head, not Rossini. Oh, right, the season announcement was yesterday. Full analysis from me this week sometime; apologies for the delay. Spoiler warning: contains some details about last night's Downton Abbey episode. So one of the plot points last night - egregiously, in my opinion - was an appearance by an Australian singer. Eventually, it emerged that she was an Australian opera singer, and then that she was none other than Dame Nellie Melba. That is where I started to get the fear, which turned out to be justified. The great soprano was played by Dame Kiri te Kanawa, a great singer now essentially retired. Dame Kiri is 70; I last heard her a couple of years back at the Flicka farewell recital. I remember her from the 70s and 80s, and I'd rather remember the Kiri of her prime than what I heard in 2011. Over the past few years, we have heard from many of our subscribers that they would prefer their evenings at the opera too end at an earlier hour. Following up on these comments, last summer we conducted a patron survey regarding curtain time preferences, and the outcome clearly directed us to make a change. We are therefore pleased to announce a consistent evening curtain time of 7:30 p.m., Monday through Saturday nights for the 2014-15 season. The only exceptions to that rule will be for Opening Night of the season and one opera whose overall length dictates an even earlier curtain time. A good decision, I think. And hmmm! I wonder what opera they might be talking about? Perhaps it's the one described in this NY Times article as "a co-production of [the Royal Opera House], the Vienna State Opera, the Teatro alla Scala in Milan, and San Francisco Opera." If you have nothing else to do for the next four hours, the Chatelet is broadcasting the Wilson / Childs / Glass masterpiece right now. I am not even considering productions of The Haunted Mansion and Halka in Wroclaw. An amusing press release from the LAPO indicates that it's that time of year: Christoph Eschenbach and Christian Tetzlaff have cancelled their planned appearances on January 10 to 12, both on account of illness. 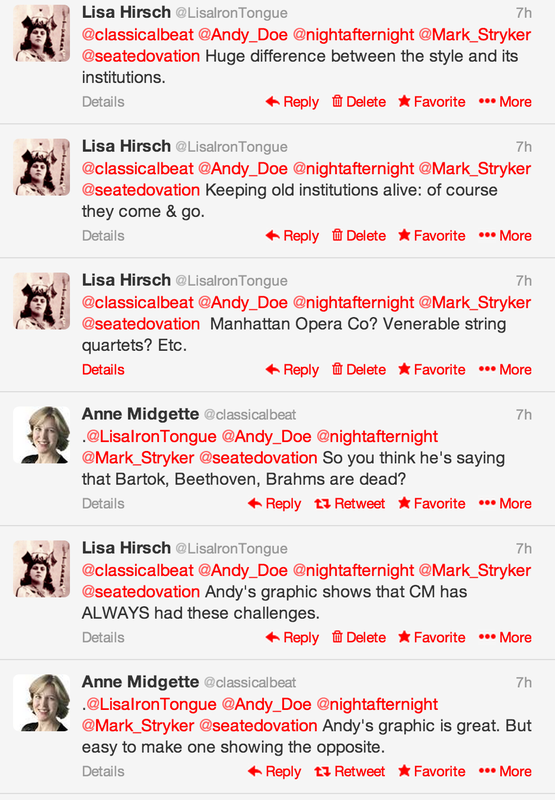 In what must have been a bit of a scramble, they'll be replaced by Edo de Waart and Augustin Hadelich. Also, the Schoenberg violin concerto is replaced by that of Beethoven. Well - I'd rather hear de Waart than Eschenbach, but I'd rather hear Tetzlaff in Schoenberg over most violinists in most concertos. Unlike almost everyone else in attendance, I didn't care much for Hadelich's appearance last season at SFS. Moral of the story: get your flu shot if you haven't already! 1. Send Save the Date email that tells you what date to save, but not why. 2. When you click on the email, you get sent to another site, where you can read more details, including date, time, and location. 4....Especially if you click the link that tells you what the event in question will cost. 5. That's where you find out that the minimum cost is $250. Several clicks to discover that this is an event I definitely don't want to attend. I think I will arrange to be removed from this mailing list. Thanks to MD and CAG for the photos. You would almost think their music reviewers and editors are unaware of the existence of the Metropolitan Opera Archive. Here's a screen shot of a Vivien Schweitzer gaff, before they read my email and perhaps correct what she wrote; it's on the fourth page of an article called "Tomorrow's Valhalla:"
Of course, Audrey Luna's agent and publicist may beat me to it. The Rach is great fun and the rest of the program is fabulous. Come and applaud this great conductor for standing up for what's right at the Minnesota Orchestra, too. Not part of the course curriculum. 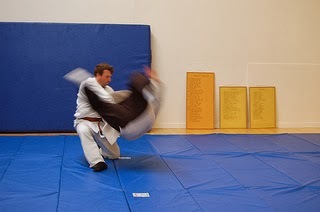 I'm planning to teach my safe rolling & falling class for non-martial artists again in 2014. This is a 10-week class, with each class lasting 90 minutes. I teach about a half-dozen basic rolls and falls from the Dan Zan Ryu jujitsu curriculum. They're the rolls and falls that are most likely to protect you from injury in cases of lost balance, trips, and falls. The cost is $200. 1. Time periods during the year when you can come to class for 10 consecutive weeks. I will not be able to schedule makeup classes, and (excepting the unforeseen) it's best to come to all of the classes. 2. Whether an evening or morning class is best for you. If you know people who might be interested in such a class, please feel free to forward this URL to them. The Music They Made - This Year, with Classical! Perhaps being slapped around by Alex Ross last year is what did it: this year's compendium includes John Tavener and Rise Stevens. 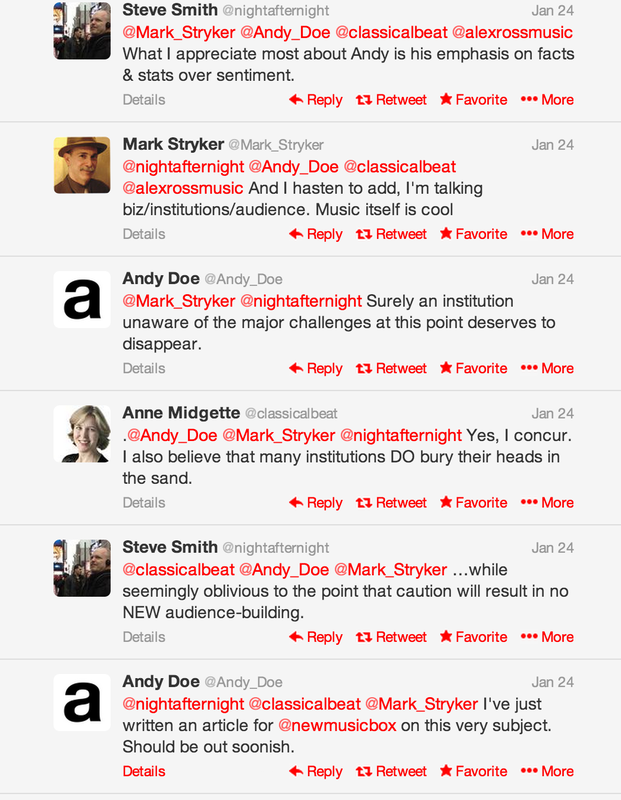 If you missed it, here are the disingenuous excuses published last year about why the feature had not previously included classical music.